Another batch of 1,786 pilgrims today left Jammu for the high-altitude Amarnath cave shrine of Lord Shiva in south Kashmir Himalayas. Escorted by the CRPF, the pilgrims comprising 1,485 men, 301 women left in 53 vehicles in a convoy for Baltal and Pahalagam base camps this morning, officials said. With today's batch a total of 17,146 pilgrims and sadhus have left Jammu for Amarnath since the yatra began from Jammu on June 28. As many as 15,813 pilgrims paid obeisance at the holy cave shrine yesterday and 62,608 pilgrims have done the same till date. 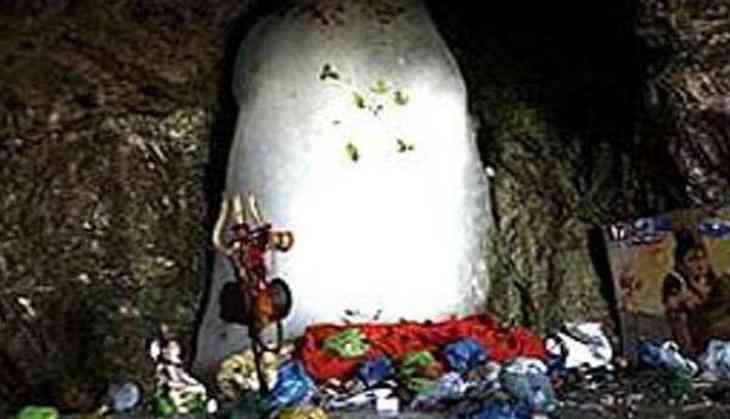 Amid multi-tier security, the 40-days-long yatra began from Jammu as the first batch of pilgrims left for twin base- camps of the 3,888-metre high cave shrine in south Kashmir Himalayas on June 28. The government has mobilised a heavy security blanket of over 35,000 to 40,000 troops including the police, the Army, the BSF and the CRPF for the yatra. This years yatra will be eight days shorter against the last years' 48 days and it conclude on Shravan Purnima (Raksha Bandhan) on August 7. Situated in a narrow gorge at the farther end of Lidder Valley, Amarnath shrine is 46 km from Pahalgam and 14 km from Baltal.